You can use or create your login for freehollywood.net or login with your Facebook credentials. Musk & Trump Talking at Last! I want to start by thanking Peter, because he saw something very early — maybe before we saw it... America has the most innovative and vibrant companies in the world, and the pioneering CEOs joining this forum today are at the top of their fields. My administration is going to work together with the private sector to improve the business climate and make it attractive for firms to create new jobs across the United States from Silicon Valley to the heartland... There's nobody like the people in this room, and anything we can do to help this go along we’re going to do that for you. You call my people, you call me, it doesn’t make any difference. We have no formal chain of command.... We’re going to make fair trade deals, we’re going to make it a lot easier for you to trade across borders. There’s a lot of restrictions, a lot of problems that I think you see. And if you have any ideas on that, that would be great. Cook and Musk joined Trump for a smaller meeting after the other technology executives leave, a spokesman for Trump's transition team said. Perhaps he's already leaning on Elon Musk as an example to Tim Cook of what Apple should aim for with their manufacturing... Give Elon a chance to tell Tim about the machine that builds the machine and looking at manufacturing with a first principles approach. Massive props to Peter Thiel, the unsung hero of today. 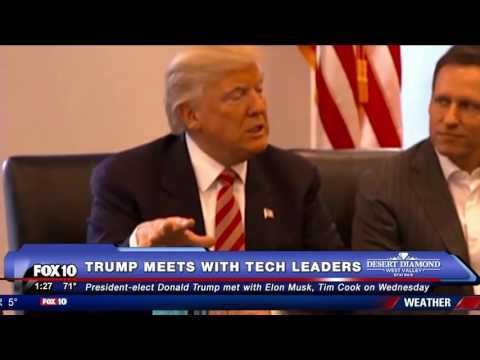 What's incredible, is that of all the people in the room, Musk was the only person invited to join Trump's advisory team, even though his companies market capitalization between SpaceX and Tesla which now includes Solar City, is only $47 billion, which is less than one third of the next smallest company, Cisco with a market cap at $154 billion, and yet he's the one to lead more than any of the others. If Ayn Rand was writing about captains of industry in Atlas Shrugged, this room is it! And Atlas just did a bench press!